Meridian sound system for new Range Rover Sport | What Hi-Fi? Following their previous partnerships on models including the Range Rover Evoque, new Range Rover and MY013 Freelander 2, Meridian Audio and Land Rover have got together to offer two audio systems for the new Range Rover Sport, just going on sale at prices from £51,500. Two Meridian-branded systems are available, one offering 16-channel amplification totalling 825W, and 19 speakers, while the flagship set-up has 1700W split across 22 channels, with 23 speakers including drive units in the vehicle's headlining. 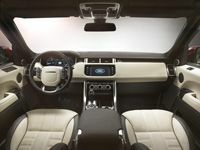 The systems use Meridian Trifield 3D processing custom-designed for the new Range Rover Sport, said to deliver distortion-free sound, deep bass extension and clean, clear treble, and stable stereo imaging from any seat in the vehicle. The 825W system is standard on the £74,995 Autobiography Dynamic model, and a £1000 option on the other models in the range, while the 1700W version is a £4000 option range-wide.